Big Fat Myths : When you lose weight, where does the fat go? Most people assume it turns into heat and energy, but Albert Einstein showed us that diets would be devastating if this were true. The correct answer is that fat is converted to carbon dioxide and water. Energy is released, but no mass is created or destroyed. This was known when the First Fleet sailed into Sydney and yet it took two more centuries for Ruben Meerman to show that precisely 8.4 kilograms out of every 10 kilograms of fat are exhaled, while the remaining 1.6 kilograms become crystal clear water. His calculations were published in The British Medical Journal in December 2014. Meerman begins this diet myth-busting book by reminding us what we already know: that human beings are carbon-based, oxygen-dependent life forms. Where do the carbon atoms we exhale come from? Carbohydrates are hydrated carbon, and so are fats, whether they're saturated or not. Eat less, and you'll exhale the excess carbon stored under your skin. 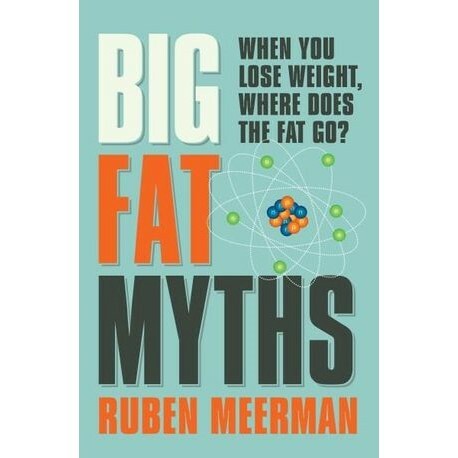 Big Fat Myths lifts the veil on weight loss by tracing every atom you eat into and out of your body. Diet myths and wellness nonsense topple like dominoes along the way, restoring your confidence in common sense and the age-old wisdom that to lose weight, you simply need to eat less and move more. Ruben Meerman is a physicist known to a generation of Aussie kids as the ABC's 'surfing scientist'. His career began in the laser industry but he has been performing science demonstrations in kindergartens, primary schools and high schools for two decades. He is a former presenter on Catalyst, Rollercoaster, Sleek Geeks with Dr Karl Kruszelnicki and Adam Spencer and he was the first ever resident scientist on Play School. Ruben's curiosity turned to the science of weight loss in 2013 after losing a few kilograms of his own. In the process, he discovered widespread misconceptions among doctors, dietitians, personal trainers and the general public. His findings and novel calculations revealing the precise fate of fat were published in the British Medical Journal in December 2014. His new mission in life is to rid the world of diet myths and weight-loss nonsense.